"David in parts was fantastic. We are so grateful for Lichtsinn's remarkable service. Thank you!" "I just want to thank you David, for your excellent and timely service concerning my small lightbulb order. I put a lot of energy into trying to find those darn festoons and one of my forum searches led me to you luckily. You are an outstanding service provider and a very pleasant personality to boot." "Thanks so very much for your prompt and professional response to my order from California. I was in need for a new cover for my Itasca Navion and amazingly received it at my home in CA the next day after my call to you. I also received the new door latch for the TV door in our kitchen and replacement parts for the bathroom within two days. We have already replaced the kitchen cabinet door latch and replaced the handles in the bathroom that had tarnished and could not be cleaned. Because of your prompt assistance, we are good to go for our next adventure and the Navion is looking great inside and outside. Thanks again for your prompt response to my needs. I will be sure to pass this story along to other Winnebago owners." "This is my first order with Lichtsinn RV, even though it's a small order I'm very impressed with the service and I'm sure the service is as if it was a big order. Thanks for people like you (David), your follow up was excellent your company is lucky to have someone that cares and is knowledgeable of your job. KUDOS to you and I'm sure I'll be ordering again excellent service. Thank you!" "When I brought my RV up to the Winnebago factory service center a couple weeks ago they were unable to give me an appointment until late September, that wasn't good enough for me. I decided to drive about a mile north to Lichtsinn RV. Fortunately they had a last minute cancellation for a service appointment, so they were able to fit my RV in last week. I was very pleased with the professionalism, knowledge and service from everyone I came in contact with. When I picked up my RV yesterday I was very happy to find every issue had been fixed. I can't thank Lichtsinn RV enough." "As first time RV owners, we can't compare Lichtsinn RV to any other dealer, but I can say this. If car dealers were half as courteous and knowledgeable about their products as Lichtsinn RV was about theirs, it would make car buying a lot more pleasant. Reed was our salesman and was very courteous and helpful in introducing us to, and showing us around the Vista LX we purchased. The whole process went off smoothly. The young man that gave us the orientation was terrific and very practical in his explanation of the different systems and gave us excellent tips on maintenance. After the orientation, he helped us pick up a few basics that he knew we would need on our first outing. We were also introduced to Anders in service who was also most kind. Nice store, nice people, good deal. What more could you ask for? Thanks for all you did to make our first purchase a pleasant experience." "Brian Buffington met us outside promptly for our 7:30 appointment! Ron rushed to open the door as we entered the dealership to find the customer lounge. Stacy offered to get us a car if we wanted to go get some lunch while we waited. And every staff member we encountered greeted us with a friendly smile. We watched all the activity since we arrived Tuesday afternoon and we are truly in awe! You all are amazing people and the dealership ... well, there's no doubt in our mind that it's tops in the nation - a first class operation! Second, and more importantly .... a huge thank you to you, Luke, and any other service tech(s) who worked on our coach." "Quick note of praise for Anders. He helped us work out numerous bugs in our coach that otherwise would have kept us off the road for days. He is very responsive and always provides useful tips. Of all the reasons you offered to purchase from Lichtsinn RV the service adviser support has been the most invaluable." "Orientation was the bomb, Brad in service went above and beyond! Jason in sales and Brandon in the business office were great!" "The Service team Justin, Brian, and Anders are the absolute best. No matter what question I have, they all take the time and help me understand the solutions. 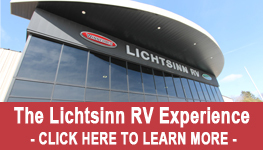 i would highly recommend Lichtsinn RV to anyone looking to buy a Used or New RV." "I've been working with Justin Overland since we purchased our 2017 View, a year and a half ago. He is always pleasant and has taken care of every service need I've had including working with my insurance company on the damage caused by the hail storm. My sister Nancy and her husband Ken just had their 2018 View in for some warranty work the other day and had the same experience with Justin. This is the email I sent to Justin: Thank you for taking such good care of my sister Nancy and her husband Ken the other day. We drove together to Laughlin, Nevada and hung out for a week with two of my brothers before they drove to Iowa. I talked to her today and Nancy said you made sure all the repair items were fixed and everything was working when they left. She said your a great guy and it was a pleasant experience, their both pretty happy with how it turned out. See you on the way back in the spring for the doors and Sumo springs." "I scheduled an appointment through Brian Buffington to have HWH Levelers installed on this unit. We arrived on September 28th for our appointment the following morning. The service team was ready to go early that day and we were provided a loaner car to see some of Forest City. This in itself was remarkable. Never have I experienced a dealership offering loaner vehicles for its customers. Additionally, the customer waiting room was fantastic, especially allowing pets to accompany their owners, but then again who owns who. The motorhome was ready around 2:00pm and Luke the service technician went through the operation of the levelers. I appreciated his attention to detail even though I have had them on previous diesel coaches. By the way, they have worked flawlessly on our return trip home. Again, Brian, Luke and the entire service team is to be commended on their professionalism and attention to the customer. In all my years of motorhome ownership, I have never had an experience as positive as this. I wish all RV dealerships took this positive approach to working with customers. Thank you again for creating a business atmosphere that promotes such a positive experience for its customers." "You guys did it one more time yesterday. My gas springs showed up before 10am. Delivery time was exceptional. By the early afternoon I was enjoying coffee on the patio watching all my basement doors stay open without bag clips. I ordered unrelated items from another company earlier on the same day and have yet to receive them. Again - good job." "We just concluded a purchase of a Grand Tour and give a big thumbs up to all the Lichtsinn personnel involved. I had been talking with Reed Burkholder off and on for 3 years as we anticipated our next RV and he was always helpful and forthcoming with information. We were able to work out all purchase and trade details over the phone before traveling from Tennessee to Forest City. Dan Helgeson was our advocate in securing favorable financing and in working out the documentation details required. I spent several days on-site before taking delivery and then a few afterwards as we moved from one coach to the other. Hanna Lunning stepped in when Reed was away to facilitate the delivery and further smooth the process. Also, thanks to Justin Overland in the service department for his continuing help after the sale. I anticipate coming back to Lichtsinn for annual service." "We received exceptional service from Kurt Gabrielson in your parts department. Kurt went above and beyond to help us get our Navion sold. The RV dealership in St. Louis had our motorhome for 20 days and did not know what was wrong with the propane system in the Navion. I called Kurt as I had ordered other parts for our Navion from him and knew he was knowledgeable and extremely helpful. Kurt was just a phone call away to lend his expertise by sending schematics and suggestions. He also called us multiple times just to check on our progress even though we did not order any parts from him. He truly is a genuine nice guy who wanted to help us in any way he could to get our coach sold! We finally brought it home and my son was able to troubleshoot and solve the problem but Kurt was by our side via phone every step of the way! Kudos to you for employing such a dedicated caring person! I will recommend Kurt and your dealership to anyone who needs expertise in the RV parts area." "I want to send a big thank you to Anders and the rest of the team who performed warranty work on my 2017 View 24G. I continue to be impressed with the professionalism and outstanding customer service. Problems happen and no one likes it when they do but poor service only makes things worse. Not the case here. Thanks team Lichtsinn!" "Some of the nicest, polite crew you will ever meet. The concerns we had were taken care of promptly and in a very professional manner. This is our second Motor Home, our 1st was an Itasca Navion in which we loved but we needed more room. Traded up to a Winnebago Sightseer 33C, we now love that. I'm 6' 4" tall so the queen bed fits perfect. From sales, to orientation, to maintenance desk, to the service department, 5 stars from us. I should tell you we bought this RV over the phone from just watching the videos, thanks Reed. We will return again and thanks for making our experience stress free." "I hope I do not need too many parts, but if I do, I will be calling you first. The service from on the phone to getting the part in two days was great. Thanks again." "Started with a Winnebago and went to another, so called, "higher quality" brand from another dealer...big mistake. For price and quality, you can't beat Lichtsinn and Winnebago. The sales, management, service, and parts staff are top notch. Lichtsinn made the buying experience very easy and stress free and exceeded my expectations!" "I recently purchased a Minnie Winnie 22M from Lichtsinn and it was a great experience! Special thanks to Jason, Brandon, Luke, Justin and Hannah... as well as anyone else I may have interacted with when I was there... Everyone I met was knowledgeable, professional and very friendly. These guys put customer service first!" "A few weeks ago I purchased a 2018 59G Travato and I would like to express my appreciation by recognizing five employees. First, I need to say that if it wasn’t for Nicole Lovik-Blaser’s professionalism and patience I would had never purchased a Travato. Nicole was the playmaker and after several phone conversations she had me talk to Dan, in Finance on the phone. It was after one phone call with Dan that I determined he was really a knowledgeable man. Dan patiently worked through financing, insurance and warranty programs with me. Thus, after working with Nicole and Dan I decided to come from New Jersey to purchase my Travato from Lichtsinn RV in Iowa. Upon my arrival I was picked up by a very friendly driver at the airport who made a two hour drive to Forest City seem like only 60 minutes. Next, I met Nicole who walked me to my Travato. Then she introduced me to her son, had me meet the Sales Manager Hannah Lunning, arranged for a courtesy car and gave me directions to the nearest hotel and restaurant. By the way, I had a great evening in Forest City and found the people to be very friendly. The following morning I drove up to the dealership and saw my Travato out front. Nicole introduced me to Brett, a service technician. Brett gave me a two hour orientation and was very patient, knowledgeable and professional. Brett introduced me to Anders, my service consultant. Anders gave me his business card, answered some additional questions and informed me that he was my go-to guy if I ever had any problems or questions. Frankly, Anders made me feel comfortable knowing that I had someone to call. I then met with Nicole again and she brought me to Dan's office to finalize the purchase of my Travato. Nicole greeted me afterwards and congratulated me. After spending the night in your lot with other RV owners I headed back to NJ. A two day trip back home turned into three days since I wanted to break in my Travato correctly, not exceeding 60 miles per hour. In closing, I commend Lichtsinn RV on their business program and their employees professionalism. Also, I would like to say thank you, to everyone who made my experience in purchasing my Travato. By the way, I named my Travato “KJ” after my kids, Kristin and Joseph. Also, I'm happy to report I am getting along well with KJ but KJ could never replace my kids who now live in North Carolina and Florida. However, I'm hoping KJ is going to make my trips to see them more enjoyable." "I am officially no longer a wannabee. I flew to Minneapolis last Tuesday (May 16th)and was shuttled to Forest City, Iowa by Larry. We were at Lichtsinn by 1:00. My tech was Brett and he did a very thorough job going over all of the systems. Of course, even with taking notes, I promptly forgot a lot. I got to spend time with Brandon Mondt (Business Manager aka the money guy), Hanna (not sure…maybe Nicole’s boss) and Anders Bartleson (Service Consultant) he was very helpful and will be my go-to-guy when I have a question. Lastly I can’t say enough about Nicole Blaser. Nicole was so pleasant to deal with and always going the extra step to make sure everything was taken care of. I was rushing because Colorado was having a snow storm due in on Thursday night…that I forgot to take pics at Lichtsinn. Well the snow storm came in early and hit while I was driving in. Have I said yet how much I love my G. As I was driving the screen, where the speedometer is, said icy roads. I looked and the temp outside was 37 and it was raining. As I laughed at the silly thing, there was suddenly 3 inches of ice on the road and multiple cars in ditches. Yes one of Colorado’s hail/sleet storms. We made it just fine, thanks to the warning. Has anyone else had this happen? I think my Travato's name is Lucy…she’s a girl, red, and makes me smile...the name is still a work in progress..."
"Didn't buy a Winnebago from these fine folks...bought my 'dream come true' 27' International Serenity Airstream that just happened to be sitting on the lot the day I stopped by on a whim! Stacy was a delight to work with. Brandon started the ball rolling, but kudos also goes to my USBank banker who was fantastic in creatively financing a 'used' Airstream that didn't follow strict NADA pricing norms. Brian made sure I got the right weight distributing hitch and even helped install it...and finally, thanks to Travis for the thorough walkthrough and basics of RVing! It was, overall, an easy transaction...and a fairly unique one in that your typical sale does not involve a beautiful silver bullet. Thanks for helping me start my adventures...I'll stay in touch!" "When we started our search, I was sure that I would buy locally in NY, but after communicating with Stacy Anderson many times and understanding all the potential benefits of Lichtsinn we changed our mind. As promised by Stacy and Dan, the long distance transaction went very smooth. We flew to Minneapolis and Lichtsinn driver picked us up and brought us to Lichtsinn and we were given a car to use while in the area. That afternoon Mark gave us a 3 1/2 hour orientation and was very patient answering all our questions. We stayed overnight the first night and became familiar with our new View motorhome before driving home. Before we left, Stacy setup a tour of the Winnebago factory which increased our belief in the quality of the motorhome. We drove over 1,400 miles on the trip home, taking care to break in the Mercedes Diesel engine as directed. We had one issue with the stabilizer alarm and a quick call to the service department pointed me in the right direction to take care of the problem. (Thank You Brian) Since being home we had a couple minor issues that Anders solved quickly. Thank you to everyone at Lichtsinn for making this purchase a great experience." "We have really enjoyed our Rialta. We have traveled all over the U.S. and even to Canada and Alaska. The Rialta has come in handy since our children and grandchildren live across the country. I wanted to tell you that Lonnie and David in the parts department have been super. They have helped me with parts over the years, even when substitutions or modifications had to be done. They really know their stuff. Lichtsinn's is a first class operation, and it's so nice that the company is in for the long haul and treats their customers so well. I was in Forest City back in November, and wanted to see your new facility, but could not stop by, as I was trying to outrun an ice storm. But I will stop by next time I am through that area. I wanted to tell you that I have recommended your company to people over the years, and assure you that I will be checking with you first if we ever decide to buy another RV. Tell your crew that providing first class service really does make a difference. I hear your company name mentioned all the time. " "Thank you to David Straw, needed a drawer slide for my 2017 Vista LX 30T. I had no part #, David located it from my description and said it "would go in the mail this (5/03) afternoon." To my surprise it arrived at 11:00 am CDT on 5/05. I am very impressed my the excellent response, thank you again. Camping World (where I bought the motor home) took 45 minutes to figure out the proper part # and the price was 50% higher. Am looking to upgrade to a diesel class A, will be talking to you guys. " "Lichtsinn RV team was friendly, knowledgeable, polite and addressed all our concerns and needs. I never felt pressured to buy anything but spent around another $10K on various things. I am particularly glad that I added the automatic leveling system. The time Brad spent showing us the RV and how to operate everything was very helpful and his advice prompted our decision to by the automatic leveler which he and other technicians installed right away. " "Returned to Lichtsinn RV for routine checkup after very positive experience with purchase of new ERA 4 months ago. Met by Anders Bartleson, Service Consultant, who reviewed my maintenance list + a few new items he was not expecting. Inspite of a day and a half of work, he finished everything of importance by closing. These folks are amazing and I will drive back another 1,000 miles whenever I want the best!" "Exceeded expectations in all respects! Certainly the most satisfying vehicle purchase ever. Ron Lichtsinn and the entire staff demonstrated their commitment to customer (or "guest" as they say") satisfaction at every contact. From my first phone contact with salesman, Reed Burkholder, he set the tone of responsiveness, honesty, and service. Lichtsinn RV was in a whole different league from the dealers closer to home. I admit we did have some hesitation about flying 1/2 way across the US to pick up our Winnebago View and drive it back to Connecticut. We are so very happy we did. The pricing was competitive and the service had been incredible. Everything was scheduled at our convenience and they accommodated some needed changes. After an early morning flight from New York, we were picked up at the airport and driven 2 hours back to Lichtsinn. Once there, Reed started the process for us. Brett Torkelson, a service tech, spent hours with us going thru the demo. After we finished the demo, we were able to park our new RV and plug in to on site power for our first night. We were given use of a courtesy car while our RV remained parked at Lichtsinn. The next day we had more questions and a few punch list items...all given prompt attention. Our Service Consultant, Justin Overland was consistently patient and helpful with our many questions and concerns. Overall, an awesome experience. Our appreciation to the fine folks at Lichtsinn RV for our happy entry in RV travels. (And a special note of appreciation to Ron Lichtsinn, who undoubtedly sets the standards of customer service and supports his staff in providing it.)" "We live in Florida so we had plenty of dealers to choose from, but we soon discovered that the dealer for us was 1600 miles away! Lichtsinn RV's reputation is well deserved. From our first call, to Casey, until we drove away with our Winnebago View, our decision was confirmed. Casey guided us effortlessly through the whole process. We learned so much from our four hour orientation with Mark. We still have so much to learn. That's another reason why we feel very fortunate to be dealing with Lichtsinn RV. Since our journey back to Florida we have called Justin Overland, service consultant, many times. Like everyone we have met at Lichtsinn RV, he is extremely patient and very pleasant. Traveling is easy for us, knowing Justin, or another friend, is a call away! We have 6,000 miles on our coach....our miles. We left Iowa with 35 miles on our beautiful Winnebago View!" "The grabber latches I ordered on Mon, and u shipped on Tuesday arrived today (Thursday).Like totally awesome!!!!!!!!" "Just wanted to say thank you for shipping the rubber antenna. Most businesses wouldn't even bother to search for such a cheap part, let alone ship it. You are now my #1 RV parts supplier. Congratulations for your commitment to customer satisfaction and thanks again." "Stacy, Dan, Anders and the entire Lichtsinn staff are knowledgeable, friendly, prompt, and courteous. Our family has a history with Lichtsinn Motors and have found them to consistently provide excellent service. We will not hesitate to continue our business relationship with them in the future." "Our salesman Reed, financing advisor Hannah, service rep Anders, service technician Brett and owner Ron all greeted us like a homecoming - "Welcome Home!". During our stay at the dealership we were given a loaner car which was very helpful." "We had an excellent orientation with Brett. He was very patient with our newbie questions and was thorough when going over the details of our new RV." "I was passing through Iowa, when my wife called, and told me I received a Recall Notice. I stopped in at Lichtsinn, and asked about it. They did the recall right there. Only took an hour, and I was back on the road." "Customer Service at Lichtsinn is very well executed in sales, service, finance and all other facets. This is a dealer that understands that the customer comes first -- and that that will result in successful sales. The friendly people are a bonus! We look forward to a continued service relationship with Lichtsinn RV!" "Brian and his crew fixed everything on our list quickly and perfectly. This was more than we had expected as we only had one day. The rig inside was cleaned perfectly from their activities Thanks to everyone.."
"What a pleasant surprise to have a person answer the phone when I called to order parts! A real live person answered, took my order, and worked with me over the phone to figure out the part number of an additional part we needed. I wish I had gotten his name. He was very helpful, patient, knowledgeable, and just plain nice! I've ordered parts from Lichtsinn online before, so I know they will be here in a timely manner and that they will be the right parts.."
"Expressing appreciation to the staff for kind attention shown at my recent service appointment. Thank you for the respect and tolerance for all concerns and questions, no matter how small! Wonderful to be able to stay on-site when coming for sales or service at your facility. View 24J, all the way!!." "The sales and technician staff at Lichtsinn RV were so helpful to us as first-time-RV buyers. We traveled there to research our purchase for many reasons. The exact motor home we wanted was available there. The one-on-one training and complimentary overnight trial run right on Lichtsinn's property was a benefit that we highly valued. The next morning the technicians added follow-up support to the fulsome training we received the previous day to respond to question after our one night experience. But something I have valued beyond those things that one could say you should expect upon the purchase of a motor home, is the patient and expert responses to my questions that have come during or after a new travel experience. They also helped link us to local experts & service providers for our Era. I am proud to be a Lichtsinn customer and recommend them to others. Special thanks go to Reed Burkholder and the technicians who have helped this newcomer to the RV way of life. We are now ready to head out on our first cross country jaunt.."
"These people are awesome there service guys really go the extra mile to get what you need thanks guys keep up the good work"
"I wanted to take another opportunity to tell you, Joshua, Anders, Brian and the entire service staff how much I appreciate the extra service you have given me since I purchased my coach 6 months ago. Everything has been appreciated – you all have been wonderful." "Chris, THANK YOU! You really went above and beyond running down to WGO to grab the motor before they closed to get it overnighted. GREATLY APPRECIATED!!" "While there are many places closer than our 1,340 mile round trip, there are none with the expertise, professionalism and warmth we were treated to at Lichtsinn RV." "Once again, I am indebted to David Straw, (RV Parts) of your company. We discovered on Friday, May 27th, that our rear air conditioner had gone out. The local RV Dealer said they would need 10-12 days to get the part needed to fix it. On Saturday morning, I sent out a "help" e-mail detailing my problem. I did not expect to hear anything back until sometime Tuesday, Monday being a holiday. To my surprise, I heard back from David. He found the part and e-mailed me back during a holiday weekend that you had it in stock. First thing Tuesday, I called him and ordered the part. It was overnighted to me, and my air conditioner was up and running by Wednesday afternoon. This is great customer service." "Recently I discovered that I had lost the cap to my oil filler tube on my Winnebago. I contacted Winnebago and they told me I have would have to go to Ford to get a new one. At first, I got the same answer from Lichtsinn. But when I explained that I was traveling, was far from home, and would have great difficulty in locating a Ford dealership, David Straw (in the Parts Department) stepped up to the plate. He took it on himself to contact the local Ford dealer up there, got the part and shipped it out to my granddaughter’s home. I picked it up yesterday and installed it today. This is why Lichtsinn RV is so popular with us Winnie owners. Only wish more dealers were this good!" "We took delivery of our 2016 Nation 24J in May, 2015. Last week, May 9th, I returned to your dealership to resolve warranty items before our first year of ownership was up. I could not have had a better experience! Your service department did a great job in addressing our warranty issues. Justin Overland, and the tech in the shop, performed at 100%. While I had a long list, some 12 to 14 issues, many were minor items that did not effect our ability to use the coach. Several, did require a fair amount of time to repair. The coach was in the shop all day Monday and two more hours on Tuesday. The end results were better than I could have hoped for! During an inspection of the motor home, a caulked seal on the roof, was found to be defective and was repaired (I didn’t know I had a problem). Justin expedited a “purchase order” with HWH and saved us $500+ on leveling jacks we had installed later in the week. All and all, we will be back. See you down the road. Thanks!" "There is only one No. 1 Winnebago/Itasca dealer: Lichtsinn Motors. Despite living over 600 miles from the dealership, we were able to purchase a '12 Winnebago Adventurer mostly via phone and email. Casey provided information we asked for, and did not pressure us at all. She took care of all the details before delivery, and kept us informed as the coach was being built. I was equally impressed with owner Ron Lichtsinn. He was definitely not a "desk jockey" and kept busy doing things most owners would consider beneath them. When we observed his work ethic, we knew we had selected the right dealership. Financing was a breeze, taking only a few minutes to sign a few papers. We can't say enough good stuff about Brad who led the pre-delivery inspection. He was awesome! Brad was patient with us, answering all our questions, and taking time to explain the inner workings of some of the mechanical and electrical "stuff" that interested me as an engineer. And he spoke highly of Winnebago/Itasca (that may seem normal, but it is rare that a service tech thinks and speaks as highly of a product as did Brad), another sign that we had chosen correctly. From initial contact to working with the Parts Dept., we found Lichtsinn to be as advertised: the No. 1 Winnebago/Itasca dealership. I highly recommend them." "Our dealer was Lichtsinn RV. Winnebago does not do delivery. We really like Lichtsinn RV for a number of reasons and would purchase another unit from them. We went back for a some warranty work. There was a leak around the hydraulic pump (leveling jacks) that I likely could have fixed but decided there could be a big downside if I stripped a connection while trying to tighten. While there the tech thought the jacks were making too much noise, the Lippert rep came over from the factory and concurred. There were no jacks in the parts stock so Winnebago took the out of the production line. Jacks were replaced the next day and we were on the road. Lichtsinn RV treated us like family. Winnebago is a star. We are totally pleased." "Lichtsinn RV is about your only option. They are fine folks as others have said. We just picked up our new coach from them last week, and were able to have a very good walk through with the tech who was able to explain every little detail to us. They did find a few minor problems during the PDI, and went out of their way to make sure that all was right before we left." Brad & Ben are incredible people persons who diligently pursue the goal of complete customer satisfaction. They are real professionals. You are fortunate to have them and they are privileged to work for an employer who is locked in to supporting their efforts to please customers. Casey, Jason and Hannah all know that good service was a primary factor in our purchase of the first 2015 Journey 40R 'off the line' at Winnebago. As customers, we really appreciate that cooperation between service department & supportive owner management. It also confirms my research regarding Winnebago as the original and now the best manufacturer of Motorhomes in the industry." "I needed a part to repair my motorhome and Chris Anderson in your parts department when beyond the call of duty to help me. He didn't stop calling and searching until he found what I needed. Be proud to have people like Chris working for you. Thanks so much." "Recently as we were finishing a long trip thru the Rockies and plains we were in Iowa and discovered a water leak from the left wheel well area. Since we were planning on going near Forest City, IA anyway I called Lichtsinn Motors. It was Friday afternoon. Tim the service manager there worked us in for first thing Monday AM, even though they were booked for two weeks ahead. As I was checking the vehicle in, he asked if there were any other things we wanted checked since it was still under warranty. I gave him several minor items but told him they only mattered if he had time to get to them. The water leak was the most important. They gave us a courtesy car, allowed us to stay there all weekend, and fixed everything on the list by noon Monday. "I needed a replacement part for my Winnebago which my local dealer could not obtain. There were problems but Lichtsinn Motors came through with flying colors. I am very satisfied with their service, especially the efforts of Lonnie Fox, and am delighted that Winnebago partners with people and companies of this caliber." "Wanted to tell you how much I appreciate the great customer service your Parts Department provides. I do not buy to many things so not a big customer but I am always treated with friendly and helpful service. We have very active Yahoo User Groups for the View-Navion and everyone is always complementary of Lichtsinn RV, whether is it Sales, Parts, or Service, you standout above the other dealers. Anyway, very nice dealing with the Parts Department today. Dave took my order and made it a pleasant experience once again." "I just wanted to take a minute to say how impressed I am with your operation and the service department in particular. Understand that I go out of my way to have work done at your service department. The dealer that I bought my coach from is only 15 miles from my house, but I refuse to take my coach there anymore...so I drive my coach 120 miles to Lichtsinn to have it worked on. I consider it to be a minor inconvenience for the good service. Just wanted to let you know that I'm a very satisfied customer." "David, once again you have impressed me with your tenacity to find answers to my somewhat bizarre questions. I now carry your name and number with me in our motor home. The next time a fellow traveler ask me, where do you think I can get a...I will honestly be able to give them the best possible source! Thanks again. "Lonnie Fox in your RV parts department deserves a pat on the back for a job well done. I was having problems with my Winnebago and locally no one seemed to have any idea of what to do to even repair it including find the correct part. After a wrong part arrived, I did not make myself clear as to what I needed, Lonnie expedited the return and had the appropriate correct part drop shipped overnight so the repairs could be made."